Dark vs. Light: Which Do You Choose? As I started to play Star Wars the Old Republic I was constantly learning new things and encountering new features that I hadn’t seen before. As I was leveling my first character I came across my first mission that at the end left me with one of two choices, these two choices where either a Light Side or a Dark Side option. I wasn’t sure what they were exactly, what they did and what they offered and as the screen filled red after my choice was made I knew this was going to be an amazing feature in this game for me. After some research I discovered that Light Side Tiers and Dark Side Tiers both offer their own great features for choosing either side, today I’m going to cover some of the cool things about picking a side in this war will offer you. Light Side and Dark Side Tiers are calculated based on a total pool +/- the opposite points. You can receive points by choosing them in missions, flashpoints, or operations. If you have the Crew Skill Diplomacy, you can gain points by sending your companions on missions. If you are focusing on one path and want to get through the tiers fast, you really shouldn’t have any points in the other. It’s pretty clear what side your choice will count towards before you pick them on your mission. The Light Side points have a light blue star icon and the Dark Side points have a red and black icon. Certain Tiers unlock even more things in the game for your character. Let’s move on to talk about how your gear and equipment can be affected by your choices. As you level throughout the game you might come across a random drop or see a “custom” piece of gear for sale that either says “Requires Dark 1” or “Requires Light 1.” This means that someone with only a Dark level above Dark 1 can equip certain items and the same goes for the Light 1. This means that certain gear and weapons are only available to those individuals who choose to target a side as they level in the game. Before you get worried that maybe you’ll miss out on some awesome stats due to your choices, don’t worry, the gear is the same stats wise. The only differences between them are cosmetic (hilts, colors, etc). If you try to remain neutral in throughout game, please note that at this time there is no “Neutral” Gear. However, representatives from Bioware have said numerous times they have plans to do so. Now that we are hunting in style, let’s talk about your overall look. 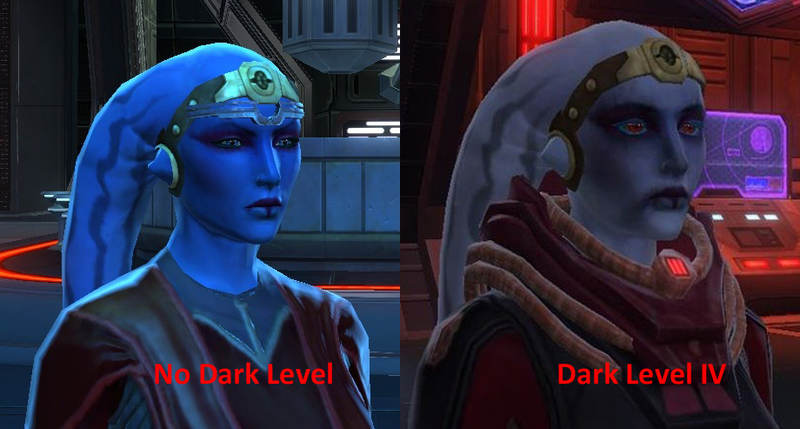 As you go deeper into your choices for the Dark Side, not only will your gear have a chance to change but you will defiantly notice your appearance changing. At first you won’t notice much but by Dark Tier II you will notice yourself a bit paler or grey, with dark color around your eyes, more veins in your face and your eyes may have even changed colors. By Dark Tier IV you will notice dramatic changes from the way you used to look! Below is an example of some of the drastic changes some characters in the game will experience with the different levels. 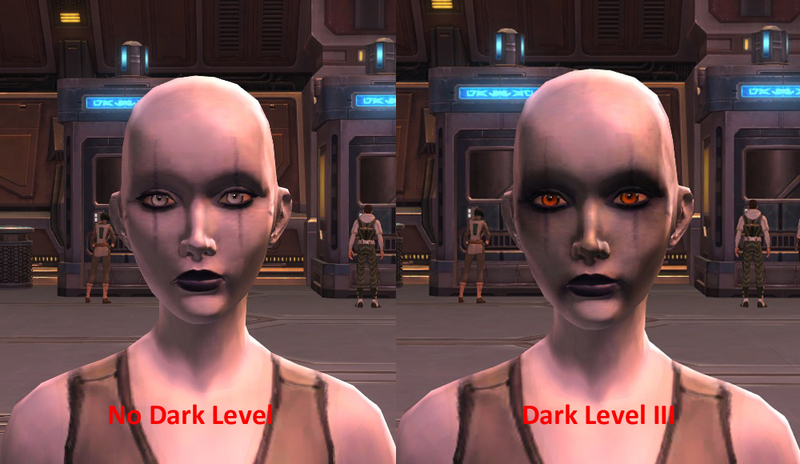 Please note that there are no changes by going the Light Side route here, appearance changes are only affected by Dark Side points. Everyone loves titles right? I have to say that I love collecting them and switching them around all the time. I’m such a nerd that on my Imperial Agent when I go “undercover” I make sure not to have a title on that could give away my Imperial position. Well with the Dark and Light Tiers you unlock two new titles! When you reach Dark Tier 3 you receive the title “Destructive” and at Tier 5 you receive “The Loathsome.” When you reach Light Tier 3 you receive the title “the Honorable” and at Tier 5 you receive “the Pure.” What is a better way to show your true allegiance than with an awesome title that lets everyone know your true devotion? You might be saying ok this is cool and I want to join the opposite side I’m on (Jedi going bad, Sith going good) but I’m scared that it might change my storyline or get me in trouble. Well it’s a good news/bad news thing. Good news is it won’t change your storyline or get you in trouble, you might get a strong talking to but overall it won’t change too much. The bad news is it won’t change your storyline or get you into trouble. Some folks, a couple of my friends included, wish that it would change the storyline. Many don’t quite understand how they can kill someone, hurt someone, steal something or lie and afterwards they are still on good terms when they weren’t supposed to that in the first place. I have to say that I agree as well about those points; however I can’t even begin to imagine the development task that it would take to create something like that. Maybe this is something that we will see being developed more in games but at this time choosing one side over the other won’t change the storyline for you. One last thing you might ask yourself is about your companion. For some people, myself included, like keeping their companions happy and if they aren’t on board with the side you have chosen it can make a friendship a little awkward to say the least, and can even make achieving romantic relationships harder. While there are ways to keep your companions happy other than saying the right thing on a mission, having the backup support from your companion on your choices can be nice and help increase their affection level fast. Be sure to research your current companion and pay attention to their moral choices, this will typically let you know how they may feel about the side you might want to go towards. Please note that no one companion is always happy with one side always being chosen. You can search for your companion on www.torhead.com and check out everything you want to know about them before making a decision. So now you know the many cool reasons to pick a side in this galactic war! So let your inner Jedi loose or allow your love of the Empire to seep out and reap the rewards! 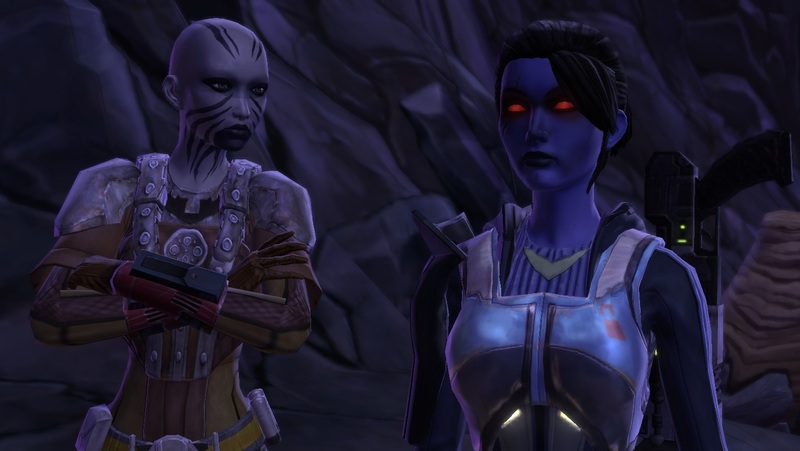 SWTOR Professions and You: Delegation at its Best!